In the photos the cuticles look pretty red but in RL there wasn't a hint of it. 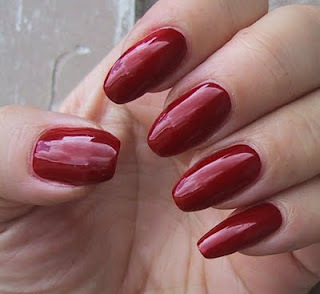 I was quite pleased with how cleanly I applied it, not getting any onto my cuticles as I SO often do with red polish. Of course the sun has been behind clouds for ever here. So this is the brightest pic I got. 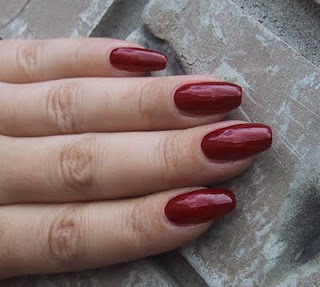 It looks like a cherry red jelly in the bright light but when you get indoors or into shade it becomes this deep rich vampy red. Great deal. I'm in love. I promise to be back soon with some more nail art pics! I'm not a big fan or reds, but this is really pretty!